Elements: Chain Lift Hill, Dive Drop, Airtime Tunnel, 270° Helix, Loop, Zero-G Roll. Train Arrangement: 2 cars. Riders are arranged 4 across in 2 rows for a total of 8 riders per car. Lofty, peep, Pokemaniac and 3 others like this. TMCoasters, DelPiero, Coaster Hipster and 2 others like this. Oh wow, that looks fab. I think this ride will be very overlooked, and I think this will be an awesome ride, especially with the theming it is clear it will have. That POV video doesn't do the ride any justice, they just skipped out on all the theming. Is that the opposite of being overlooked? Oh, that was a typo, fixed. Keep reading this as 'Mack Dynami-T-EE'. Howie, Tomatron and DelPiero like this. peep, Matt N, Pear and 1 other person like this. From spring 2019 "Dynamite" will make its rounds in Plohn. 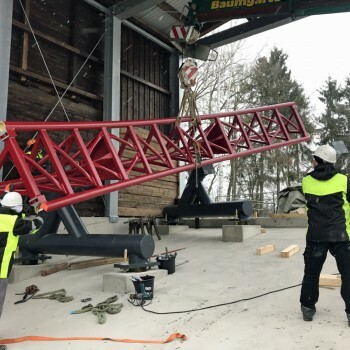 The goal is to be ready for the season opening on 18 April. 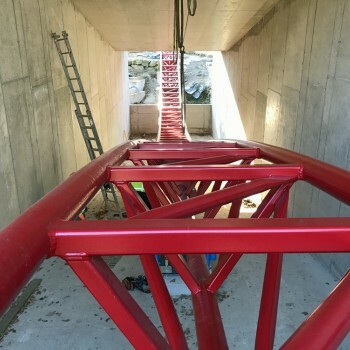 "Ultimately, it depends on the weather, we want to finish the steelwork by the end of February, then we have to pull the power cables, concrete is still needed at the bottom of the support columns, for that it needs to be frost-free, and then we need six weeks of testing," the junior boss looks says. Pear and Lofty like this. w8erbahn, Hutch, vaugc002 and 2 others like this. I was expecting it to be a lot more circular, especially from seeing the animation. Also, the guy pointing at it made me chuckle for some reason. I shoish probably get out more..
That... that looks so weird. At the moment it resembles the loops found on the Pax shuttle coasters. Coaster_Greif, Luca B and vaugc002 like this. I like the look of it, minus the supports. The inversions look solid and hopefully they're taken at a decent speed. So the loop actually looks normal, it was just the angle taken of the previous photo making it look very tight. Here's to tomorrow's construction blog update. Doesn't seem like too long until the ride will be finished! 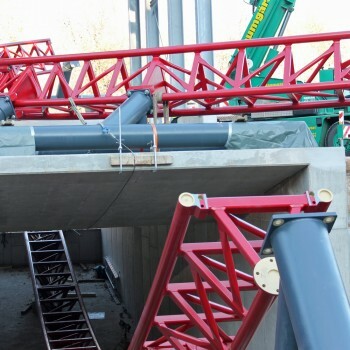 A whole load of new pictures from the park's blog. Coaster Hipster, Hutch, CrashCoaster and 3 others like this. 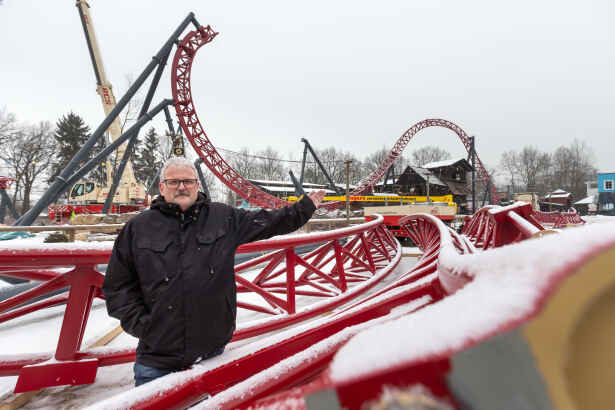 Looks almost like Mack's take on a more traditional lift hill looper. Looks cool! That loop looks like it ocould be great. If this was painted black, I'd say it looks pretty damn similar to Saw and/ or other Eurofighters tbh. Really starting to like the look of this. What a lovely shade of red. Yeah I actually kinda of like what I'm seeing here. I was disappointed in the length of the ride during the reveal, but I think it'll be fine. It looks cute. Lost Gravity also looks pretty interesting so we'll see how this turns out.